Growth is shifting, innovation is relentless, disruption is accelerating, expectations are high, and social tensions are rising. Making sense, and making use, of these dramatic forces of change will help you to make better strategic choices, shape markets to your advantage, and create a brighter future. Everyone talks about “megatrends” … so what are the most significant forces of change? I spent some time comparing the many different approaches to tracking and articulating these patterns of change, to find out which trends are the most common, and the most significant. Isn’t it obvious? Technology is shaping everything? Yes, but its the implications of that, which matter. As McKinsey says “the trend is your friend” … It’s the oldest adage in investing, and it applies to projecting future business performance too. Their analysis shows that capturing the waves of change, created by industry and geographic trends, is the most important contributor to business results … a company benefiting from such waves of change is 4-8 times more likely to rise to the top of future performers. So what is a “megatrend“? Trends are an emerging pattern of change likely to impact how we live and work. 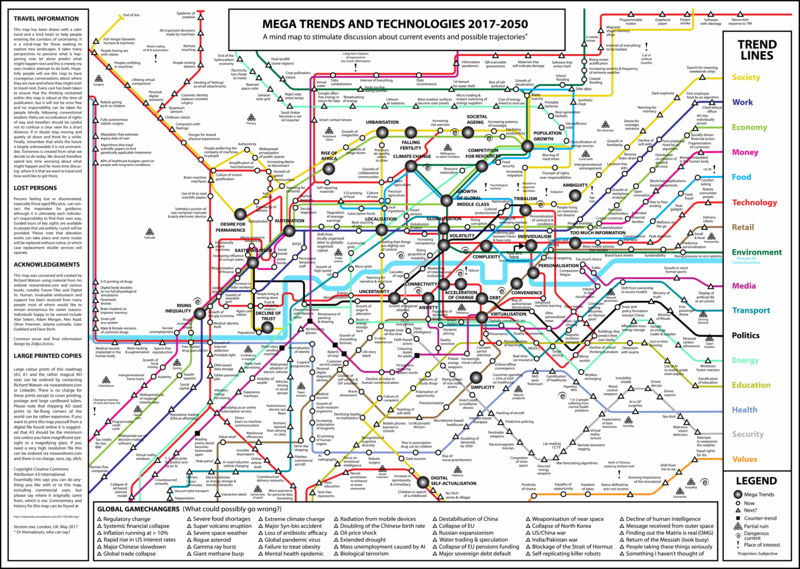 Megatrends are large, social, economic, political, environmental or technological change that are slow to form, but once in place can influence a wide range of activities, processes and perceptions, possibly for decades. They are the underlying forces that drive trends. McKinsey & Co has perhaps the most insightful view of the future, identifying 9 global forces inspiring a new narrative of progress which they clustered into three groups. I will leave the final thoughts to a few of the individuals whose perspectives I admire most. So where will all this take us? This BBC documentary explores possible scenarios for the way we will work and live by 2050. How will you get there?